Midwest Moma Blog: Moma's Pasta Salad! 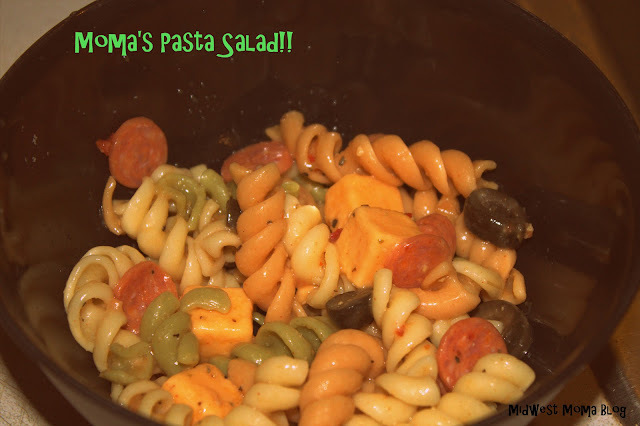 I have always loved pasta salad...especially with a good BBQ meal. My children, however, have never liked it! After a series of BBQ's with friends last summer, I finally found a pasta salad combo that my kids love....and ask for seconds! I boil the noodles as directed and drain them. Once drained, I put them in a plastic bowl that has a lid. I then add the handfuls of pepperoni and the can of black olives. I mix this up pretty well. Then I add the bottle of Italian Dressing and mix again. Once that is all mixed well, I put the bowl in the freezer to cool it. The idea is to get the temperature down enough that that the heat will not melt the cheese chunks. Once the pasta is cooled and the cheese is added, the pasta salad is ready to eat. You'll have to let me know how the family likes it! It doesn't last long around here! I would love to! Thanks for the invite!